My favorite Burrito truck, hands down. No fillers & All Flavor! Have tried both the O.G. and the Rib Rito and they are both delicious. Meat is cooked perfectly and the seasoning used is very flavorful. You get a good size burrito filled with meat and not all the fillers, plus a side of chips for $9. So excited they finally came to Navy Yard. Very friendly staff and quick service. Highly recommend!!!!! 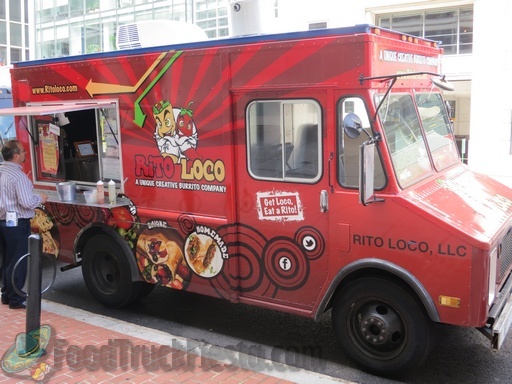 The Rito Loco truck provided great customer service and quick turnaround. The OG Rito is legit. If your in the mood for a well seasoned and deliciously crispy crust burrito, this is the place to go. Mojito Rito has a great slow cooked taste. Habanero Red hot sauce is awesome. soggy burrito. good chips (not handmade). meat abit dry. I wouldn't go back. had the OG burrito at a work meeting tasty enough. burrito not made to order. were pre-made which caused the soggy tomato-ness. Just as advertised, the burrito had no filler and actually had flavour. I loved how the meat inside was moist, but did not seep into the tortilla so you can eat out of hand. Nice service. I will be visiting this truck often. First taste June 1 at the "Taste of Two Cities" in Baltimore,MD. Let me just say OMG, the OG Rito was very good. I wish I would have bought 3 more to save for the next day. The person at the window with the friendly smile, let me try a sample of the ground angus and it was very good, with a lite kick at the back of your throat. I am a fan of this DC truck! Very disappointed by the O.G. ; had the Rib previously and it was flavorful enough that their "no beans no rice" style didn't feel lacking, but the O.G. was exactly what's wrong with this idea. Flavor was uniform, uninteresting, and just generally dull. There's a reason people put toppings on taco seasoned beef; a smattering of pico and cheese didn't do it. Would not repeat. I don't get the hype over this truck. Its pretty much a glorified taco bell taco. It was soggy and very messy to eat. The only saving grace is the quality of the meat was OK. My friend had the OG and his comments were pretty much the same as mine. Is This One Of Your Favorite Trucks? : YES! Best burrito from a truck or brick and mortar store. I always get the OG because it's so good and some of the chipotle red sauce. It's enough food to fill you up and have left overs for dinner. A definite must try food truck. Food was awesome and people were very cool! Everything was made fresh, including a great habanero salsa that went great with the savery-ness of the rib meat! 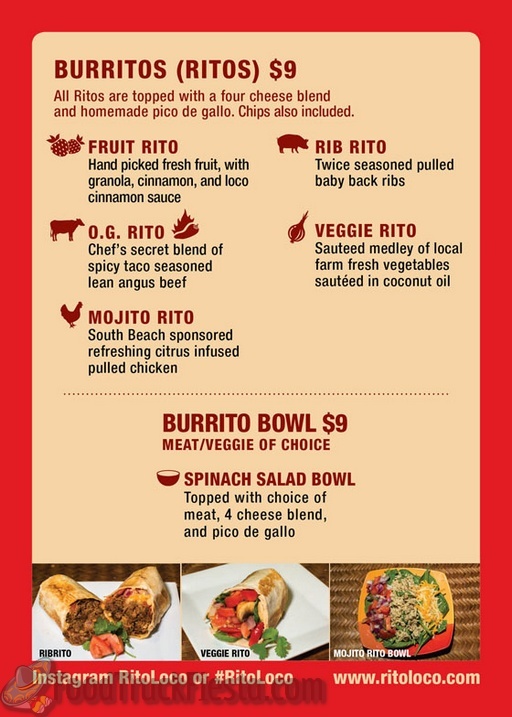 Rito Loco offers unique burritos, none of which will contain the normal fillers that take away from the over all flavor. Instead of rice, beans, corn, and lettuce, Rito’s are filled with ingredients like pico de gallo, fruit, mint, and a variety of seasoned meats. Three vegetarian items are available, one of which is a FruitRito, that combines a medley of fresh fruit and other items. They will be serving beef, chicken, and pulled rib with contrasting ethnic flavors. The signature component of the Rito is the toasted tortilla and all Rito’s will undergo a flat press procedure before being served. Rito Loco offers all of their ritos as salads for a lower carb option. 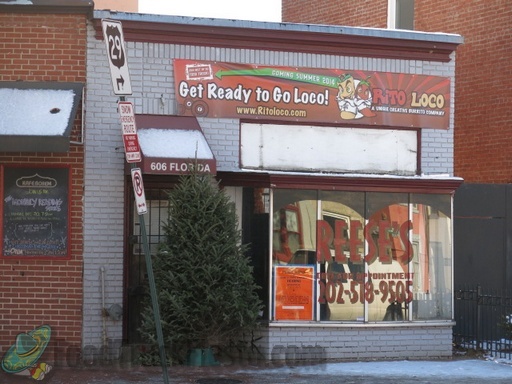 In the Fall of 2014, Rito Loco will open a brick and mortar restaurant at 606 Florida Ave NW!